Some significant action has been taken on the state level. Something different is happening after the Parkland, Florida, shooting. A renewed national conversation about gun control has prompted some states to take immediate action in the wake of the Valentine's Day massacre at Marjory Stoneman Douglas High School. While some steps have been taken on the federal level, the laws that have changed so far are on the state level. The most sweeping legislative changes after the Parkland shooting have come in Florida, but there have been other measures passed elsewhere. There are a number of states where new measures are being discussed or debated, but few have signed any such measures into law. (Andrew Selsky/AP) Oregon Gov. 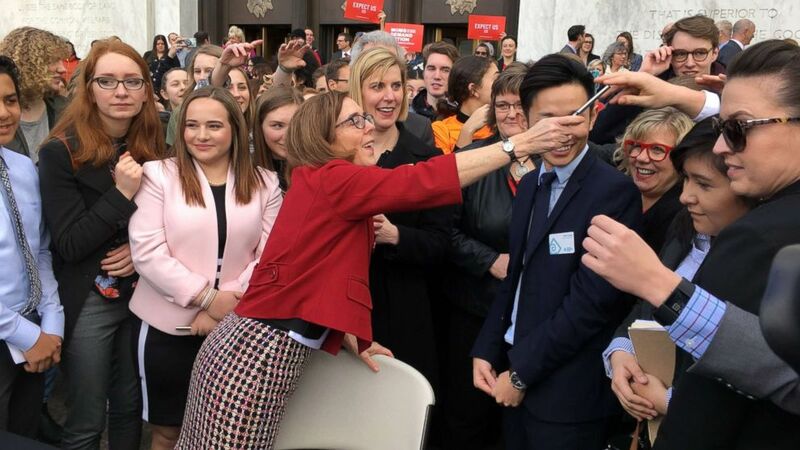 Kate Brown hands out one of the pens that she used to sign gun-control legislation on the steps of the state Capitol in Salem, Ore., March 5, 2018. The first gun-related bill that was passed in the wake of the Parkland shooting had been introduced before it happened. The bill passed on Feb. 22 banned people convicted of stalking or domestic violence, or under a restraining order, from buying or owning guns or ammunition, and it was signed into law by the state’s governor on March 5. “I'm proud to sign this bill, making Oregon the first state to take action to prevent senseless gun violence since the tragedy in Parkland, Florida," Gov. Kate Brown said in a statement released that day. The bill is said to close the so-called boyfriend loophole, as existing laws generally pertain to spouses and live-in partners but do not explicitly include romantic partners who do not fall into those categories. (Jennifer McDermott/AP) Cheers erupt as Rhode Island Gov. Gina Raimondo signs an executive order, Feb. 26, 2018, in Warwick, R.I., to establish a new policy to try to keep guns away from people who show warning signs of violence. Rhode Island established a "red flag" policy on guns with an executive order on Feb. 27 that will help keep guns away from people who "could pose significant threats to public safety." 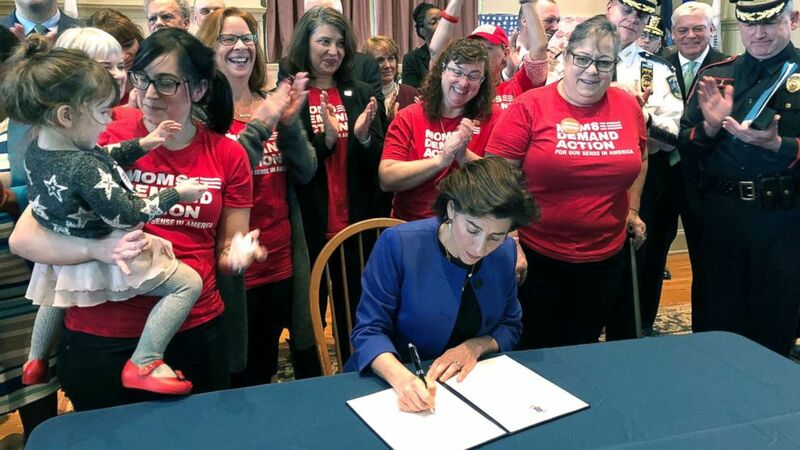 Other states -- including Connecticut, California, Washington, Oregon and Indiana -- have taken similar action on potential red flags in recent years, but Rhode Island was the first to do so in the wake of the Parkland shooting. The policy does not give law enforcement new authority to confiscate guns, but it directs them to use "all available legal steps" to remove firearms from people who have shown warning signs, including recently making threats of violence online or in person, according to the statement. (Mark Wallheiser/AP Photo) Florida Gov. Rick Scott signs the Marjory Stoneman Douglas Public Safety Act in the governor's office at the Florida State Capitol in Tallahassee, Fla., March 9, 2017. A bill was passed including a number of gun law reforms, including a mandatory three-day waiting period to buy a gun and raising the age to buy a rifle to 21 years old. The law also included a measure to arm some teachers and other school personnel who undergo special training sanctioned by the state. There was a provision that allows school districts that don't want to participate to opt out of the program. The school safety bill was signed into state law by Gov. Rick Scott on March 9 as he was surrounded by parents of the Parkland shooting victims. (Ted S. Warren/AP) Washington Gov. 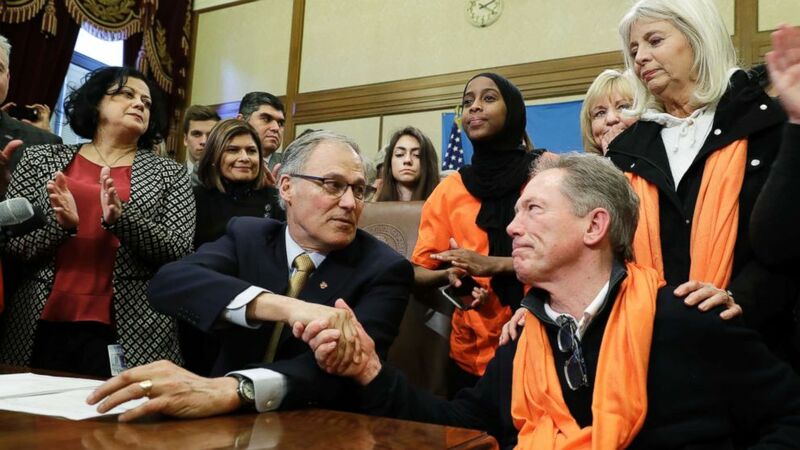 Jay Inslee, center, shakes hands with the father of a shooting victim after Inslee signed a measure into law that bans the sale and possession of bump stocks, March 6, 2018. Gov. Jay Inslee signed a bill on March 6 banning the sale and use of bump stocks, which were used in the Las Vegas shooting in October. In his tweet about the passing of the law, Inslee named Parkland as one of the "many other locations whose names have become synonymous with tragedy." President Donald Trump has made changes to suggestions about gun law reforms over the past few weeks, but one issue that he has taken action on is a federal ban on bump stocks. On Feb. 20, he sent a memorandum to the Department of Justice that directed Attorney General Jeff Sessions to ban the devices that effectively turn legal weapons into machine guns. On March 10, the DOJ submitted a notice to the Office of Management and Budget that federal law be changed to ban the possession, sale or creation of bump stocks. That will need to be reviewed and approved by the OMB before the directive goes into effect. Separately, congressional aides said that a measure intended to improve the federal background check system has been included in the government spending bill, according to The Associated Press. The so-called "Fix NICS" measure, which includes the acronym for the National Instant Criminal Background Check system, is a bipartisan proposal that has been approved in the House but stalled in the Senate. Similarly, the STOP School Violence Act passed in the House on the same day as the National School Walkout but has not been addressed in the Senate. The bill authorizes $50 million per year for grants administered by the Department of Justice to fund training and other initiatives intended to enhance school safety, and $25 million annually for physical improvements such as metal detectors, stronger locks, and emergency notification and response technologies for schools to notify law enforcement of emergencies.